As you may have seen from previous blog posts or on my Instagram, last year I went island hopping around Greece and Italy for 3 weeks. And for some reason I’ve only wrote one post on it?? So 11 months later here’s another one! As it’s approaching summer time and prime travelling time I thought I’d revisit my Greek travels and do a post on things to do in a day in Santorini. 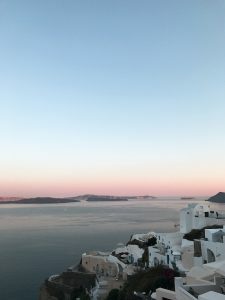 Ahh, Santorini, the dreamy Instagram island with it’s white washed buildings and gorgeous sea views from crystal infinity pools. It’s probably placed high on most people’s bucket lists. I mean, who wouldn’t want to visit this slice of paradise? I sadly only got to spend around two days on this island, one of which was mainly getting our bearings and chilling. So we only really had one day to explore and do as much as we can. Which was hard, especially when on a budget. But thanks to our lovely hotel staff we were able to get the highlights of Santorini all in a day. 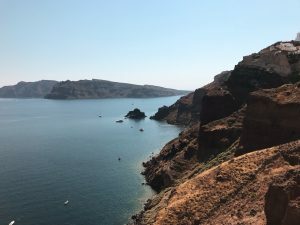 So here’s my guide on how to spend a day in Santorini: where to stay, what to do and where to eat. If you’ve seen any photos of Santorini, it’s most likely of the town placed at the top of the island called Oia. And honestly, you’d be lucky to get a 2 night stay there for under £300. But I did some hunting around and found this cave house AirBnB which, for Oia is pretty affordable if you want the luxury feeling without completely breaking the bank. If you’re more for getting a hotel I found the Anemoessa Villa which is about half a mile away from the centre of Oia. But I wouldn’t rule out the other towns on this Island. Transport isn’t the best here but you can still get around. I stayed in Perissa, right next to a quintessential black sand beach, some mountains and some great food places. I’d highly recommend staying at the Ancient Thera Studios – it’s one of the most affordable places I found and the rooms, although basic are really all you need. And the staff are absolutely lovely – we ended up turning up at 2am and they were so nice about it! Also it’s in a great location. If you get the chance, definitely visit one of the black sand beaches (caution: wear shoes otherwise your feet will fry). The one next to our hotel was pretty quiet and was right next to some food places. They’re perfect for a chill day. 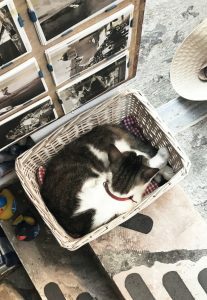 And if you love cats and dogs you will both love and hate Santorini. Love because they are everywhere. Hate because a lot of them are sadly stranded, and like me will want to take all of them home and care them to health (I did see one which was missing an eye which broke my heart 🙁 ). But luckily the locals do seem to be pretty welcoming of them and care for them. To get as much done in a day as you can, I would recommend going on a boat tour. The owner of our hotel showed this to us. And despite feeling pretty poorly I went anyway as I didn’t want to miss it. Essentially, for around 35 Euros you get picked up by a bus, taken down to the port where you hop on a boat. They first take you to some hot springs for a little swim. You then visit an old volcanic island and learn about the volcanic rocks and the history of it all. Next is a stop off for a bit of lunch on a really remote town. They give you time so you can spend some time walking across the town (it’s only like 100m wide however). 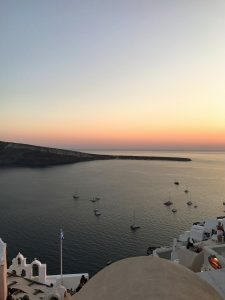 And finally it drops you off in Oia just in time to do some exploring and then watch the sunset which was pretty damn spectacular. However it was heaving, so make sure you find a high up spot quick! You then hop back onto a bus which will take you back to where you were staying. I will also warn you as much as this day trip is great for doing everything in a day. But they still make you pay to go up the volcanic rock and you pay for your own lunch. Neither of which are too expensive though – maybe take your own packed lunch to save some pennies! Obviously when in Greece, you’ve got to have all the Greek salads. Can confirm I haven’t had one like it since. Also you have to have Gyros, the Greek version of a kebab basically. You can get them as sort of takeaway meal or a bit more done up in restaurants. You can get them with different sorts of meats, I personally had chicken and, holy crap. I could honestly go back there just for the Gyros. A part from that I didn’t really have many of the traditional dishes. But anything including aubergine or seafood is great. They do it right in Greece. Their wine is also pretty good as well! As for actual places, if you’re staying in Perissa definitely try out NTOMATINI. It’s a very cosy and casual restaurant but has great food! There is also a video of me, hopefully locked away somewhere, in a Greek dance as they had some form of music night on. So if you’re into absorbing a bit of culture too definitely go there and look out for their music nights! I could go on about this wonderful Island forever, but this post is already getting pretty long. 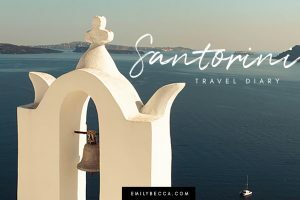 So I hope you enjoyed my little travel guide for a day in Santorini! I’m dying to visit here again so if you have an recommendations do let me know. Oh my goodness, it’s so nice seeing pictures of Santorini, I love it there! Greek food in general is so amazing as well isn’t it? I could pretty much live of Gyros and greek salad. Such a dreamy beautiful destination where bucket list dreams come true. It looks absolutely beautiful! Definitely somewhere I need to visit in the future. I love love love Santorini!! The boat tour was probably my favorite part. I love your photos! Gorgeous pictures! 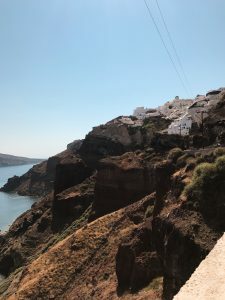 Santorini was one of my favourite trips! Aww thank you! Yess I need to go back! Thanks for sharing! Greece is even higher on my bucket list now! Your trip sounds like a dream. Santorini Is very high on my list of places I’d like to visit but I’ve never known anyone “normal” (not an influencer or celebrity) to go! So glad you’ve posted this, seems little less out of reach for me now. So helpful!